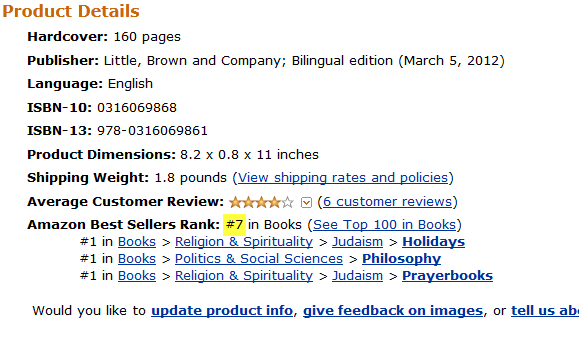 A haggadah is #7 bestseller on Amazon? Last month, I blogged on an interview with Nathan Englander on his new “hyper-literal” New American Haggadah translation. Given Englander’s inability to articulate what he is doing, and what he thinks he means by “literal” and then by “hyper-literal,” I find him somewhat to be a real-life version of Foer’s character Alexander “Alex” Perchov in Everything is Illuminated. In the end, the White House decided to stick with the Maxwell House next month. Notice that Nathan Englander is nicely avoided in that little quote, and it was Foer, not Englander, who hawked the volume on Stephen Colber’s show. I have to admit, I had a copy on pre-order that arrived on February 29, and I hope to post a review at some point. I’m so glad you noticed already how the Englander translation is being sold as the Foer. And speaking of hawking, notice how in the article, “Good To The Last Dayenu,” that I’ve linked to above, there’s the embedded advertisement for the New American Haggadah, and when you click it, it sends you off to the commercial facebook page, not of Englander the translator, but of Jonathan Safran Foer. Kurk — I’m not sure that I am understand the point you are making in your first paragraph. That article is talking about the 2011 changes in the translation of the Maxwell House Haggadah. However, I do not think this haggadah breaks real new ground in translation approach. In other words, it has been overhyped. There are much better choices for study haggados for the Conservative/Conservadox/Modern Orthodox crowd, including the Silber haggadah, the Schechter haggadah, the Sacks haggadah, the Soloveitchik haggadah, and the Hoffman haggadah. On the other hands, none of these have the Foer publicity machine behind them. The Maxwell House Haggadah, of course, is perfect for actually using during the seder proper, since it is free and one need not feel guilty about spilling wine on it. Theophrastus – thanks for asking me to clarify. The newest Maxwell House version makes “King of the universe” the gender-neutral “Monarch of the universe” and replaces most of the male-centered pronouns and possessive words that refer to God and other overly-gender-specific phrases with inclusive ones. As the review I linked to puts it: “Think Four Children instead of Four Sons.” So it’s these 2011 changes that the Foer/Englander version seems to ignore. It has “sons” as in male children only. 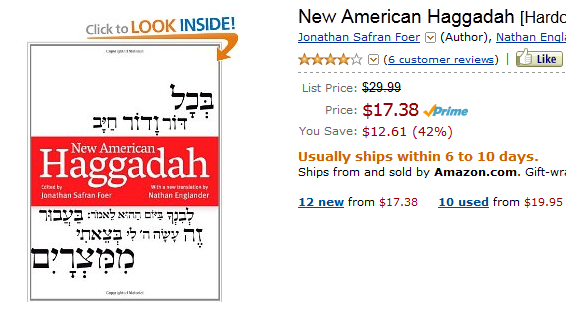 While I agree with other reviewers that there is, indeed, much to discover and like in “New American Haggadah”, I feel that Nathan Englander’s decision to retain gendered language in his translation poses a serious obstacle for many potential readers and users of this haggadah. Hebrew is, indeed, a gendered-language but English is not. There is no need to read out half the population with an insensitive translation that gets in the way. Our ancestors of whom we read in the haggadah were men AND women, not just our “fathers”. References to God as “King” are extremely limiting, unnecessary and unhelpful. Because of this unfortunate decision on the part of Englander, this haggadah will find a place on my shelf, but not on my seder table. I am a big fan of Nathan Englander, so I was very excited to hear about this new hagaddah. Alas, it’s a major disappointment. The first problem is that the Hebrew translation uses male language. I understand that Englander was trying to get to the essence of the original language, but in 2012 there is simply no excuse for an educated Jew to exclude half of the Jewish people from the story of the Exodus. The hagaddah commands us to experience the seder as though we were all present during the escape from Egypt, yet this hagaddah only talks about fathers and sons. I won’t go so far as to say that I think it’s a deliberate insult, but I found it grating and distracting. There’s no reason for this any more if you’re trying to appeal to a non-Orthodox audience. I am also very disappointed in this haggadah. The language is patriarchal in the extreme — inexcusable for 2012 for something designed to be “American” rather than orthodox. For example, the God language uses phrases such as “King of the Cosmos” and the text makes many references to the patriarchs but none to the matriarchs. This old fashioned bias makes it very distracting to use this as a source of inspiration for a holiday that celebrates freedom. I found some of the commentaries thought provoking but certainly not worth the financial investment in buying this haggadah and the time investment I made in trying to find things to incorporate into my own seder. Just wondering what you think of this, whether this really is “hyper-literal” translating. How should haggados in English refer to people, both males and females? It’s a long debate, but since the Hebrew liturgy takes priority, the question is really whether to change the Hebrew. The traditional Hebrew actually is sexist. You need to know that haggados are almost always printed in Hebrew (and that is considered the primary text, even if a secondary translation into English appears), and in most households, at least some of the liturgy is recited in Hebrew. Even in liberal wings of Judaism, children are sent to study Hebrew — typically for several years — to prepare for bar mitzvah and bas mitzvah ceremonies. Of course, actual fluency in the language varies, but it is nearly universally accepted that the Hebrew has priority. For example, see this article. In recent publications, for example the Conservative movement’s Machzor Lev Shalem (a special prayerbook for the High Holy Days) the text actually splits into parallel columns in the Hebrew, one with gender neutral terms and with the traditional text. The English translation similarly tracks both in parallel columns. The situation is not parallel to the question of the translation of ἀδελφός in the New Testament. In the Greek New Testament case, ἀδελφός is used to refer to both men and women, but the English term “brothers” refers only to men. In this way, “brothers” is a mistranslation of ἀδελφός. In contrast, in the Hebrew liturgy, the Hebrew itself is sexist (in referring to the patriarchs but not the matriarchs, for example) so the translator faces a dilemma. Does she interpret the translation by adding something that really was not there in the original, or does she accurately reflect the Hebrew original? The approach here has been to change the liturgy in the Hebrew and then change the corresponding English. Thank you for that very helpful explanation, Theophrastus. I understand that there’s a debate. And I’m interested in the fact that Elie Rosenfeld, who produced the new Maxwell House Haggadah, says “This is not a feminist Haggadah.” Likewise, Henry Frisch, who did the actual translating, said his goal was to make the English “more comfortable for American Jewish families.” And then about the Foer/Englander version, the one reader-reviewer focuses in on that “American” in the title, saying “The language is patriarchal in the extreme — inexcusable for 2012 for something designed to be ‘American’ rather than orthodox.” As people argue, is there really a presumption that the Hebrew language, that the orthodox viewpoint, is sexist? Are Americans really more gender inclusive with their English? Are the translators of the haggados who use more inclusive language really adding to the Hebrew? Is that similar to what Elizabeth Cady Stanton and colleagues did with Jefferson’s clause “all men are created equal” when they added “all men and women are created equal”? Can’t מלך refer generically to a monarch, whether a king (מלך) or a queen (מלכה)? Can’t these be ancestors male and female, not just the fathers? Do you think Englander’s use of “hyper-literal” is his way of avoiding the debate, of defaulting to the (sexist, un-American) tradition? Well, this is difficult because both terms appear in set phrases used dozens or hundreds of times in daily prayer in Hebrew. Let me deal with avoseinu first. This shows up in the formula Elokeinu velokei avoseinu (“our God and God of our fathers”), often followed by a listing of the patriarchs (Abraham, Isaac, Jacob). This is an ancient set phrase which shows up, for example, in 1 Chronicles 29:18 and Acts 3:13. This is exactly the usage which is in debate in Hebrew liturgy, with some liberal Jews changing the Hebrew liturgy to avoseinu v’imoseinu and adding the matriarchs (Sarah, Rebecca, Rachel, Leah). Now, one can probably justify many different translations of a set phrase (since it is an idiom) but it seems slight those who argue that this should be an inclusive prayer in Hebrew to translate it inclusively. If we translate it inclusively, we are effectively saying that those who are arguing for Hebrew liturgical reform have no standing — that the set phrase is already inclusive. In contrast, as I mentioned above, in US Conservative publications, there are parallel versions of the prayer in Hebrew and corresponding parallel versions in English. So this is exactly the point I raised in my immediate previous comment. My opinion: avoseinu sounds just as “gendered” to me in Hebrew as forefathers does in English. I don’t think the Hebrew is more inclusive. In other words, I think the traditional prayer is sexist, and since most Jewish prayer is in Hebrew, I think the resolving that question is the primary issue. The issue becomes even more complex with the aspect of royalty, which is often considered as one of the ten sefiros in mystical Judaism. If we treat melech as neuter, then do we stop treating shabbos and the shechina as female? That would make much of Jewish kabbalah incomprehensible. I don’t see a way to deal with this without, for example, erasing almost all of the passages from the Zohar in the liturgy. Having said that, I must say the phrase “monarch of the universe” sounds tone deaf in English to me (especially given the very strong rhythm in the Hebrew.) To my mind, the real challenge in translating these set phrases is getting analogues of the Hebrew in terms of consonance and rhythm and internal rhyme — and here I think that translators such as Robert Alter (in his Biblical translations) are far ahead of these mediocre translations. I very much appreciate your comment! You are so very learned and help many of us learn more. You end by pointing us to “translators such as Robert Alter,” and I’m guessing you’d have us look to Everett Fox for help as well. I find Fox to be extremely and wonderfully creative in his Hebraic English. Significantly, such anthropomorphizing expressions about God as found in the Song of Glory and the Song of Songs (in its traditional interpretation as depicting the love between God and the Jewish people) are seen by the tradition as extremely holy and requiring the protection of limited use. Yigdal is sung twice a day, but Song of Glory is saved for once a week. That is, the more material and specific descriptions of God are seen as both more false and more true than the safer and more abstract descriptions. Maimonides statements are perfectly true, and yet their truth is less understandable by humans. That is why so much of Judaism—and the haggadah is a prime example of this—is presented in the form of story and poetry. So how do we translate the haggadah? It seems to me that the solution is offered by the Jewish tradition itself: neither to ignore nor to alter the original texts, but to comment on them. The haggadah in traditional form is already structured as commentary upon commentary, and the best of the modern editions and translations simply add more commentary to the existing set. The only difference is that these new ones have crossed the point in time at which the older commentary was canonized. That’s how all Jewish texts work—the concept of “the Oral Torah”. “Commentary” in Judaism is not a conservative concept, and can certainly include new metaphors. In contrast to this, altering or mistranslating the core texts actually works against growth. Courtney: Thanks for your highly insightful remarks and examples. Courtney (and Kurk): Have you read Daniel Sperber’s On Changes in Jewish Liturgy? (Sperber has impeccable Orthodox credentials; he was faculty [in the Talmud department] and a dean of Jewish studies at Bar-Ilan University.) Sperber provides evidence drawn both from historical examples and also discusses the issues with relation to kvod habrios. However, for better or worse, gendered images of the Divine are pervasive in both mystical and popular understandings. In this regard, I think it is interesting to study what might be one of the most offensive examples in the traditional liturgy — the remarkable evolution of the birkas hamin. I can highly recommend Ruth Langer’s fascinating recent study, which I also discussed briefly here. This complex topic has yet to receive adequate scholarly treatment…. Steinscheneider, “Die Censur hebräische Bücher in Italien,” 69-70, cites a fifteenth-century haggadah manuscript with a 1495 Christian Latin commentary attached (Ms. Munich, Bayerische Staatsbibliothek Cod. hebr. 200, available digitally at http://opacplus.bsb-muenchen.de/search?oclno=217205331 [accessed May 6, 2010]). He provides a Hebrew translation of what is apparently a piece of the Latin commentary that suggest that piyyut is fully a human creation and thus can be easily altered or dropped. However, I was unable to locate this comment in the original…. This is some related to the question of how far and for what purposes a “translation” or “commentary” even might go. On a more delightful note, just yesterday, I purchased from a used book store, The New Union Haggadah, 1974 (CCAR); this edition has the wonderful illustrations by Leonard Baskin. The copy I bought also has, I’m not kidding, what looks to be wine stains on it and beautiful handwritten family notes from members one to another. So this Haggadah is not a revision of the previous Union Haggadah [of 1923]. It is an attempt at renovatio ab origine: a return to the creative beginning so as to bring forth what is utterly new from what was present in the old. Throughout, we have endeavored to be faithful to the elemental structure of the Haggadah, beginning with the statement of the theme — the movement from degradation to glory — and the intentional complement of the story of Israel’s own deliverance with the Messianic vision for all humanity. But the one of the most remarkable features of this 1974, all-male produced text is its inclusive language. (There were updates of the The New Union Haggadah in the 1980s and 90s, weren’t there, to make it completely gender neutral?) This one already has “Sovereign of the universe” and alternatively “Sovereign of existence”; and it has “The Four Children” not “The Four Sons”; and it has “Our fathers and mothers.” Is this not a popular or recommended Haggadah? I don’t see it on either of your lists, Theophrastus and Courtney. I am too busy to reply at length until, perhaps, next week. Thanks both of you for all those book suggestions! Theophrastus– I’m sure you know a lot more about this than I do, and I apologize if you’ve already written on it elsewhere (and even more so if I make errors here, which I hope you’ll correct me on). But I’ll mention anyhow for those reading the discussion that issues of changes to the haggadah are not quite the same as those of changes to the siddur (prayer book). The period of canonization of the haggadah is believed to date from at least the 3rd century CE, at a time of transitioning from the sacrificial service of the (destroyed) Temple to the “service of the heart” (prayer). The written text dating from the 9th century is extremely close to the traditional edition used today—the only significant changes made to it since then were those made by non-“Orthodox” movements in fairly recent times. Indeed, the haggadah’s status as a single coherent unit—despite its structure as a compilation of texts embedded within texts—has been essential to its use and interpretation, in a way that is simply not true of the siddur. One aspect of why this is so is that the haggadah is more in the category of Torah study than of prayer, though these categories are of course not distinct. I would say that even when the very same text appears both in the haggadah and the siddur, such as in the case of the psalms of Hallel or even the blessing after the meal, it does not fulfill quite the same function in both books. In this sense, the haggadah is really more like the mishnah itself, in the way the commentaries both enshrine and alter its central portions, even without the literal frame-shape printed in the Talmud. And by the way, questions of changing the haggadah are by no means confined to outside of “orthodoxy.” There is much discussion in Modern Orthodoxy and Religious Zionism about how and whether to acknowledge the modern return of Jews to the land of Israel in the haggadah, which would make for much more structurally disruptive changes than any alterations of sexist language would. This is a particularly tantalizing issue because the ghostly remnant of an earlier, pre-final-redaction of the seder, one with this “fifth” element of dwelling in the land/return/anti-exile, is preserved within the haggadah according to the very principles I mentioned. Courtney — there have been some changes in the Haggadah since the ninth century; for example, there are many different nusachim. A fascinating book which compares various texts is The Scholar’s Haggadah. So, I would imagine that for example, Conservative/Masorti Jews would claim that their changes were just another nusach variation. Oh yes– I didn’t mean to imply that there were no changes at all, just not major ones. I would not call the Conservative/Masorti changes major either. I like the Huck Finn example — I think teacher’s quote works against him. I would say most secular or religious literature worth reading makes you uncomfortable on purpose, while also providing tools to profit from that discomfort. On the other hand– maybe I replied too hastily to that…I’m currently getting the kids off to school, and shouldn’t even be reading this let alone responding. Even a word changed can be “major,” of course– and I suppose Gribben mainly changed a single word, albeit many times. What I was trying to get at in the earlier reply was more about a difference in the kind and manner of changes to the haggadah vs. the siddur, but I’m not at (will probably never be at) the point of being able to provide a scholarly analysis of that. Whether it comes from conservatives or liberals, there is a patronizing Big Brother aspect to these literary fumigations. We, the censors, need to protect you, the naïve, delicate reader. We, the editors, need to police writers (even those from other eras), who might have penned something that might be offensive to someone sometime. But is that really what Rabbi Bronstein (and the CCAR) is doing? Is that what Frisch (for the Maxwell House Haggadah) is doing? Is translating Haggadah Hebrew into inclusive American English (especially when the Hebrew and English are together in a diglot) really “sanitizing”? Are Bronstein and Frisch censoring? Are they patronizing? Or are they recognizing that the Hebrew is resistant to the male-above-female patriarchy? I’m glad the question of sexism is still a question. In other words, is the Haggadah Hebrew really sexist (as Mark Twain’s work is racist)? And must the haggadot English be considered radical or feminist or sanitizing in diglots used by families and communities that include females as equal to males? “There are now more than 3,000 versions of the Passover Haggadah in existence, a fact indicating its tremendous popularity,” observes Sharonne Cohen, as she describes several of them. There are hardly that many versions of Huckleberry Finn. Kurk, I think that you missed the context that Courtney and I were talking: namely the proposals to change the Hebrew of the Haggadah. The English translation of the Haggadah has no special status; it is merely a commentary on the text, and in many households, it is not read aloud. Courtney, you are raising questions that get to the nature of prayer. If the kavanah of the person praying is that the prayer be inclusive, is it better that the spoken words match the kavanah? I do not know. Of, if one follows the teachings of Rabbi Nachman and believe that true prayer is the spontaneous prayer from the heart spoken at midnight in the woods — where does that leave the liturgy? I do not know. Perhaps Breslovers cover both possibilities by praying the standard liturgy and then in private prayer their hearts’ liturgies. I am still struggling with understanding my own prayer — and do not feel in a position to give advice to others. Kurk, my previous response was perhaps too curt. Of course, translation matters — for many readers, it informs their understandings of the Hebrew. And translation matters because getting things right matters. So translation is vitally important. However, it is less important from the perspective of halacha (Jewish law). As I suggested before, many of the phrases where sexist language appears are set phrases, so we can argue they are idioms and can be interpreted in many different ways. So translators have considerable freedom. Still “monarch of the universe” has a lot of Norman-French/Latin in it which is naturally distancing; a phrase with strong Anglo-Saxon roots such as “king of the world” seems to be closer to the directness of the Hebrew. Let me give you an analogy to give you the nature of the debate in Judaism. As you know, there is considerable debate over sexist language in the Greek New Testament. Some authors, such as our co-blogger Craig have produced inclusive language translations. But how would you feel if a group produced a new inclusive-Greek-language New Testament, that “corrected” the mistakes in the Koine Greek? I do think this hypothetical example would more closely model what is now happening in this aspect of the Jewish debate. As Courtney suggests, the liturgy is considered part of the Oral Torah, so changes to the liturgy are not made lightly. One final point: there are not 3000 different Hebrew texts of the Haggadah. There are three main families of traditional Haggadah texts, and all of them are fairly similar to each other. When someone writes about the thousands of Haggadah versions, she is speaking of the commentary added to the Haggadah. I know that there are several annotated versions of Huckleberry Finn (I’m aware of over a dozen such versions). Now, true, a dozen is not thousands, but I still think the analogy is a good one. I fail to comprehend the argument by Theo against Monarch of the Universe. Robert Alter, who has been favorably alluded to, famously seeks to maintain consonance and assonance in his translations. Monarch for Melech strikes me as a worthy “Alteration.” As for Theo showing a preference for the choice of World over Universe, I would say that Judaic thinking about God does not limit God to the earth. In fact Shamayim, (the Heavens) presented in contrast to Aretz (the earth) dictates plainly that Universe is preferable. hfirsch: Alter uses “king” in his translations (although he uses “monarch” in his notes). See, for example, his translation of Genesis 17:16. In terms of semantics, I think either term is possible, but “king” is a more basic word in English — just as “melech” is in Hebrew. Similarly, my preference for “world” to “universe” is based on the simplicity of the word. In terms of contemporary usage, I think “universe” is also limiting — it is not clear to me, for example, when people use “universe” in the contemporary terminology that they also think of the heavenly realm. In fact, people use terms like “universes” and “alternate-universe” and “parallel universe” and “multiverse.” It seems to me that the contemporary use of “universe” denotes a certain spatio-temporal coordinate system that does not include heaven (one cannot direct one’s spaceship to land in heaven). Mr. Firsch — first, my apologies for marking one of your comments as spam. I restored the comment. We get an awful lot of spam at BLT, and I made a mistake in classifying your post. One of my co-bloggers connected the dots, and I understand that you updated the translation of the new Maxwell House Haggadah. I have not read that translation (although I have read about it.) It sounds as if it is a significant improvement over the older Maxwell House Haggadah. That is okay. I found this site while checking on how Maxwell House gets mentioned. You should be able to pick our version up at a supermarket. At least in the next week or so. We again printed one million plus copies this year. Otherwise you can contact Joseph Jacobs Advertising in Manhattan. I’m totally with Theophrastus on “monarch of the universe.” (Galactic Emperor? I see a fleet of starships.) There is something strangely artscrollian about that phrase—and they do use “universe,” though they would never use “monarch,” being ideologically committed to the traditionally gendered language. I do often refer to Artscroll editions, and learn much from them—but they are hard to actually pray from. My heart sinks when I read the flattened language of “helpful” translation—and I’m not even talking about extreme examples like the “allegorical translation” of the Song of Songs. I’m talking more about cases where the translation is not wrong, but is maybe too analytical, trying to reinforce the “correct” meaning of the original in a way that obscures other, more associative meanings—the poetry. I’ve been reading John Felstiner on translating Celan (the book Kurk mentioned earlier, Paul Celan: Poet, Survivor, Jew)and he gives such a vivid sense of the translator’s tightrope. But translators of liturgical texts have an even greater burden. So you end up, roughly, with the “religious” and the “historical-linguistic” translations—and one must note that the “religious”/analytical/ideological style includes the full spectrum from the most liberal to the most conservative understandings of religion. Personally I get more from someone like Robert Alter, whose style I’d tentatively class as historical-linguistic-poetic (as opposed to historical-linguistic-literal. )But yeah, he has to leave out a whole lot to achieve that. And of course even in the original language there is need for “translation”—we’re back to Theophrastus’s earlier, profoundly central, questions on the nature of prayer. I realize I should have given an example—it will have to be from Psalms since that comes to mind more readily than something from the Haggadah. Worship in purity, lest he be angry, and you perish from the way, for in a little while his anger will blaze. Blessed are all who put their trust in him. Yearn for purity, lest He grow wrathful and your way be doomed, for in a brief moment His anger will blaze; praiseworthy are all who trust in Him. lest He rage and you be lost on the way. For His wrath in a moment flares up. Happy, all who shelter in Him. I greatly prefer the Alter. ln Alter’s translation, lines 2 and 4 are indented–that didn’t come through. Sorry–one more thing–I probably should have pointed out that these are all traditionally Jewish translations, interpreting בַר as “purity” not “Son.” Alter discusses this, as well as his choice of “armed” rather than “kissed” for נַשְּׁקוּ , which seems perfectly reasonable to me in the context. Thank you for bringing in various others to consider, in the struggles over text/tradition and orality/translation. Especially since you bring up “son,” here’s how the Hoffman version (My People’s Passover Haggadah: Traditional Texts, Modern Commentaries) discusses it. Without even getting into Wendy I. Zierler’s “feminist questions about the Haggadah” – pages 71 to 78, there’s much gender inclusive language already. I’m not only referring to Rabbi Lawrence Hoffman’s discussion of “Peoplehood with Purpose: the American Seder and Changing Jewish Identity” – pages 47 to 70. But I’m also looking at the section “Telling the Next Generation: The Four Children [not The Four Sons]” page 170. In any event, regardless of whether afikoman means carousing directly or something else indicative of carousing — music, desserts, more matazah, or party hopping — it is at least reasonable to conclude that the word was associated with the kind of after-dinner behavior that Plato and Paul denounced. We can properly agree that the problem attached by the elusive warning ein maftirin achar hapesach afikoman was indeed carousing. With that understanding, we can better understand the advice given to the four children. Outside of the Haggadah, rabbinic tradition records two versions of the “Four Children” narrative, one in the Palestinian Talmud (the Yershalmi), and one in a midrash known as the Mekhilta D/rabbi Yismael. But they switch answers with regard to the wise and the simple children. In the discussion of haggadot, why Plato? Why Paul (as he writes to those in Korinth, in Greece, in Greek presumably)? Why rabbinic tradition? And why not just concede, in English, that the Hebrew specifies four “Sons”? “Ruler” Or “king.” But the Hebrew referred to a familiar, powerful figure, while the modern “king,” for most people [who read and speak English], refers either to a fictional character in a fable or to a powerless figurehead. Neither image is appropriate here. Have you read what Carole B. Balin has written for the Hoffman Haggadah (“‘Good to the Last Drop’: The Proliferation of the Maxwell House Haggadah [page 85 – 90]”)? If so, what do you think? Specifically, would you agree with her when she says the following in 2008 (on page 90)? Is it true you have felt “modernizing influences” and are these or other influences the specific ones felt? I watched the video you posted the link to, above. And I do see that in place of an illustration of a boy there is now one of a girl. I believe our intent was to create a version anyone would be comfortable with. I know that no one Orthodox has had any problem with our Haggadah. We printed over a million copies last year and another million this year. We would have heard from that portion of the populace for sure if they had problems. Most negatives have come from people making reference to earlier versions than the current one or who have not looked closely at any Maxwell House text from whichever era. Until we re-did the book, the translations (I have been told by the Joseph Jacobs people) never changed from the first version in the early 1930’s. No one seems to know who did that translation back then. The rule has always been not to give authorial credit within the book. Joseph Jacobs was kind enough to inform the media last year of my role in making changes. There may well be changes in directions from version to version. If you look at what we have out now, you will find (with regard to Grace) that Leader says, Let us say Grace; All respond. Nowhere is there reference made to ten or to ten men. Orthodox folk, who are probably going to recite the Grace in Hebrew, don’t find any problem with this. The Orthodox just know that the bracketed Our God is for the presence of a minyan. The reference to parents late in the Grace instructs that one adds parents only if appropriate. Similarly blessing husband or wife and/or children is where appropriate. Otherwise one would bless All that are here. It seems to me that anyone who wanted to change his own text at this point or anywhere else, for that matter, would do so. I think we succeed in not giving anyone who is not actively seeking to be offended any serious opportunity to be offended. We live in the current world and do know about everything going on out there and have proceeded accordingly. There is good reason why those who have reviewed our work carefully have been impressed with the result. By the way, I cannot see the Kotel in the 1990’s version, which I assume is the one Balin would have been talking about in 2008. My apologies to Henry Frisch—I hadn’t realized you use “Monarch of the Universe” in your new translation, or I wouldn’t have discussed it so flippantly. I grew up using (and often giggling through the thee’s and thou’s and wast’s ) of the old Maxwell House Haggadah. I’m sure a fairly small percentage of seder-celebrating Jews actually purchase (or even, today, download) a haggadah of any kind, and I don’t imagine my family would have even used haggadahs for the “seder” if we didn’t have those from the supermarket. This is no small matter. I think providing a basic haggadah that the majority of American Jewish families won’t find off-putting is a significant factor in keeping the Jewish tradition alive. Kol hakavod! Thanks Courtney. Please get to the supermarket before all million plus of the 2012 copies are gone. Otherwise, you can contact Aviva at Arosenfeld@josephjacobs.org to get one or more. I believe those require a shipping fee. Kurk, I’m glad you’ve gotten a hold of some volumes in Larry Hoffman’s People’s series. (1) The translator is Larry Hoffman’s son: Joel Hoffman, a well-known biblio-blogger. With two Hoffmans on the project, one needs to distinguish between them. (2) The value of the series comes from the incredible diversity of contributors — many of whom are well-known experts in the field of Jewish studies. It is the value of hearing so many voices that makes these series interesting. To me L. Hoffman’s series seems very Jewish. I have seen Christian commentaries to the Roman Missal or the Book of Common Prayer, and they are inevitably in the form of a single, authoritative voice. In contrast, L. Hofffman’s book is alive — with different voices on the page playing off each other’s ideas and arguing with each other. This is what we expect in the Rabbinic Bible (Mikraot Gedolot), or Vilna edition of the Babylonian Talmud, or in a hundred other significant Jewish texts. It is not necessary that everyone agree in the end, but through exposure of different views, we can begin to approach a deeper understanding. I think there are at least two goals of “translation” in religious contexts. One is to convey the original as completely as possible in another language — in the case of the Haggadah, to find English that captures as much of the Hebrew (and Aramaic) as possible. Another goal is to provide productive English. For instance, I think that worship services don’t always benefit most from accurate translations but rather from prayerful English. (It would make things easier if this were called something other than “translation,” but we’re not so lucky.) So if the original Hebrew of a prayer is clearly sexist, I think an accurate translation should retain the sexism, but the English in a prayerbook designed to encourage worship perhaps should not. I think the Haggadah is similar to a prayerbook, so one goal of a translation of a Haggadah for a Passover Seder, it seems to me, is that the English should be productive. Additionally, though, the point of the Passover Seder is to tell the story of the Haggadah. So, in the case of the Haggadah, there’s a third possible metric of success. I think that knowing what the original means has to be the starting point for all three, and that was the goal of my English translations in My People’s Passover Haggadah. But I wouldn’t necessarily recommend using my translations at an actual Seder. The Foer/Englander “hyper-literal” translation has attempted (as you put it) “to find English that captures as much of the Hebrew (and Aramaic) as possible,” and this yields perhaps “prayerful English” albeit English that retains what’s sexist in the Hebrew. The Frisch (updated Maxwell House Haggadah) and the Bronstein (CCAR) translations are designed to make the English “productive” in a different way, mainly “to tell the story of the Haggadah” including a wide audience and readership. Your English translations in My People’s Passover Haggadah gets at “knowing what the original means” but not “necessarily recommend[ed] … at an actual Seder” since, especially with your footnotes (as quoted further above) you are getting at the general inadequacies of English phrases for the Hebrew they would attempt to match as well as getting at the richness of the Hebrew prior to translation. L. Hofffman’s book is alive — with different voices on the page playing off each other’s ideas and arguing with each other. This is what we expect in the Rabbinic Bible (Mikraot Gedolot), or Vilna edition of the Babylonian Talmud, or in a hundred other significant Jewish texts. It is not necessary that everyone agree in the end, but through exposure of different views, we can begin to approach a deeper understanding. And your observations about the “set phrases” as “formula,” I think, are quite useful to understand the various translator goals and audience/ participant/ reader needs. I’ve been reading John Felstiner on translating Celan ([in] Paul Celan: Poet, Survivor, Jew) and he gives such a vivid sense of the translator’s tightrope. But translators of liturgical texts have an even greater burden. So you end up, roughly, with the “religious” and the “historical-linguistic” translations—and one must note that the “religious”/analytical/ideological style includes the full spectrum from the most liberal to the most conservative understandings of religion. Personally I get more from someone like Robert Alter, whose style I’d tentatively class as historical-linguistic-poetic (as opposed to historical-linguistic-literal.) But yeah, he has to leave out a whole lot to achieve that. Your classing of Alter’s style reminds me of how Willis Barnstone tries (following Alter) to achieve what he himself calls a rendering that might be “both literal and literary.” Joel’s three metrics might not be mutually exclusive of one another? Joel’s three metrics might not be mutually exclusive of one another? I don’t think they have to be mutually exclusive at all. They have the potential to pull in different directions, but they can also align. In the realm of prayer, for example, sometimes an honest translation is extremely prayerful (and surprisingly relevant) for a modern audience, while other times it makes sense to re-craft the text. It’s only in the second case that a prayerbook author has to choose one approach or the other. For example, the Haggadah even quotes that Rabban Gamliel to the effect that one who does not explain (discuss) pesach, matzah, and maror has fulfilled the obligation. Maimonides even held that it is not enough to each these symbolic foods — if one does not explain them, one has not fulfilled the obligation. The obligation to explain may help to explain the great plethora of haggados, many of them annotated. But of the 7,000 known versions, not to mention the countless homemade editions, there is one that is used more than all others combined. Since 1932, the Maxwell House Haggadah — as in the coffee company — has dominated American Jewish ritual. Having confirmed in the 1920s that the coffee bean is not a legume but a berry, and therefore kosher for Passover, Maxwell House tasked the Joseph Jacobs ad agency to make coffee, rather than tea, the drink of choice after Seders. If this sounds loony, note that Maxwell House coffee has always been particularly popular in Jewish homes. The resulting Haggadah is one of the longest-running sales promotions in advertising history. At least 50 million copies have been distributed free at supermarkets, and they are exactly as inspiring as you would imagine them to be. And yet, many people feel fondly toward the Maxwell House Haggadah, for the giddy comfort it evokes. We like it like we like Jewish jokes. The Maxwell House version, is, itself, a sort of Jewish joke — try mentioning it to a group of Jews without eliciting laughter. What’s more, it’s free, and, like the no-frills caffeine beverage it promotes, satisfies a most basic need. The most legendary of all Seders — which is, in a postmodern twist, recounted in the Haggadah itself — took place around the beginning of the second century in Bnei Brak, among the greatest scholars of Jewish antiquity. It ended prematurely when students barged in to announce that it was time for the morning prayers. Even if they read the Haggadah from beginning to end, fulfilling every ritual and singing every verse of every song, they must have been spending most of their time doing something else: extrapolating, dissecting, discussing. The story of the Exodus is not meant to be merely recited, but wrestled with. If the Maxwell House Haggadah never rose to meet the Seder’s intellectual and spiritual demands, it adequately served the ritualistically literate Jews of a generation or two ago. But the actors no longer know the script. In a further sort of exodus, American Jews have moved: from poverty to affluence, tradition to modernity, acquaintance with a shared history to loss of collective memory. Our grandparents were immigrants to America, but natives to Judaism. We are the opposite: fluent in “American Idol,” but unschooled in Jewish heroes. And so we act like immigrants around Judaism: cautious, rejecting, self-conscious, and feigning (or achieving) indifference. In the foreign country of our faith, our need for a good guidebook is urgent. Though it means “the telling,” the Haggadah does not merely tell a story: it is our book of living memory. It is not enough to retell the story: we must make the most radical leap of empathy into it. “In every generation a person is obligated to view himself as if he were the one who went out of Egypt,” the Haggadah tells us. This leap has always been a daunting challenge, but is fraught for my generation in a way that it wasn’t for the desperate assimilators of earlier generations — for now, in addition to a lack of education and knowledge of Jewish learning, there is the also the taint of collective complacency. The integration of Jews and Jewish themes into our pop culture is so prevalent that we have become intoxicated by the ersatz images of ourselves. I, too, love “Seinfeld,” but is there not a problem when the show is cited as a referent for one’s Jewish identity? For many of us, being Jewish has become, above all things, funny. All that’s left in the void of fluency and profundity is laughter. About five years ago, I noticed a longing in myself. Perhaps it was inspired by fatherhood, or just growing older. Despite having been raised in an intellectual and self-consciously Jewish home, I knew almost nothing about what was supposedly my own belief system. And worse, I felt satisfied with how little I knew. Sometimes I thought of my stance as a rejection, but you can’t reject something that you don’t understand and that was never yours. Sometimes I thought of it as an achievement, but there’s no achievement in passive forfeiture. Why did I take time away from my own writing to edit a new Haggadah? Because I wanted to take a step toward the conversation I could only barely hear through the closed door of my ignorance; a step toward a Judaism of question marks rather than quotation marks; toward the story of my people, my family and myself. Like every child, my 6-year-old is a great lover of stories — Norse myths, Roald Dahl, recounted tales from my own childhood — but none more than those from the Bible. So between the bath and bed, my wife and I often read to him from children’s versions of the Old Testament. He loves hearing those stories, because they’re the greatest stories ever told. We love telling them for a different reason. We helped him learn to sleep through the night, to use a fork, to read, to ride a bike, to say goodbye to us. But there is no more significant lesson than the one that is never learned but always studied, the noblest collective project of all, borrowed from one generation and lent to the next: how to seek oneself. A few nights ago, after hearing about the death of Moses for the umpteenth time — how he took his last breaths overlooking a promised land that he would never enter — my son leaned his still wet head against my shoulder. “Is something wrong?” I asked, closing the book. Without looking up, he asked if Moses was a real person. I see that with the Hebrew, Barenblat offers an inclusive English translation. Haq’da Qssam L’lah lb’har âla tnass l’treq ’hin khrzeu zdoud’na min massar, âla yed sid’na oun’bina Moussa ben Amram haq’da n’khrzeu min had l’galouth amen ken yehi ratson.